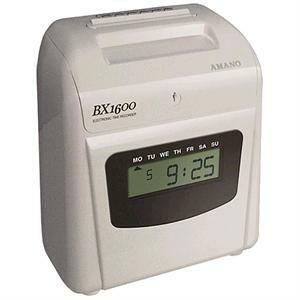 The Amano BX-1600 is a simple, clean design ideal for small businesses with a small number of employees. It accommodates weekly, bi-weekly, semi-monthly and monthly payroll, thereby providing accurate and efficient time recording. This push button operated time clock accommodates up to six punches/columns per day. Just simply press the "In or Out" button that aligns with your desired punch column and insert the card in the top feed. Easy out of the box setup. Programming for monitoring weekly schedules. Irregular print mark indicated exceptions. Large, easy to read clock dial. Dimensions: 7.5" x 8.8" x 4"